I know it’s been awhile since I’ve written a blog post (sorry! Life has just happened) but Today I just wanted to update everyone on the progress of our conversion of the carport into a playroom for our kid(s). Before we could drywall, we did have to fix a mildew issue that we found behind the insulation. Here’s a little pro tip if you’re trying to do this all yourself for the first time: make sure you caulk all your exterior nail/screw holes!! We have had one of the wettest years yet in South Carolina and because of all the rain, it slowly crept into those little tiny cracks creating mildew. Luckily we found it before drywalling or we would have had a huge mess to figure out later! John got to cleaning it up right away and used a special cleaner to prevent it from happening again. Oh and he also filled in any cracks or holes too!! After that was done, we finished the drywall in the main room and I’m so excited for it to finally look like an actual room!! After we finished the drywall, I really wanted to focus on the bathroom. 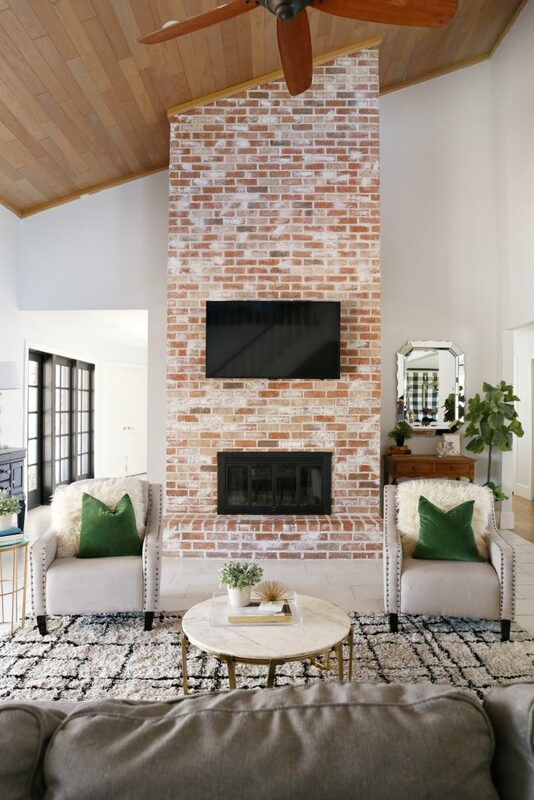 From the start, I knew I didn’t want to touch the brick in there because I loved how it looked (even though we did a makeover on the other exposed brick in the main room). It is technically the “back side” of the brick wall and I LOVED how rustic and authentic it looked. It also didn’t look like the front of the brick which had these weird white splotches on them. Who knew brick had a front facing side! With that being said, the brick was still dark so I knew I wanted to brighten things up in there with a lighter tile floor. So, Who else is LOVING the new patterned tile trend???!!!! I mean don’t get me wrong, patterned tile has been used forever but it’s made a big resurgence in the past few years (and it’s not your grandmother’s patterned tile that she has in her kitchen either) and I’m all here for it!! BUT… it doesn’t come with a small price tag. So when Christina from Christinasadventures.com posted that she got her beautiful patterned tile in her newly remodeled bathroom online, a whole new world was opened up to me!! And then I realized that Wayfair.com has a great tile selection for very reasonable prices. Now I do want to say that our bathroom is really small so the amount of tile that we needed was not very much, so that did help with fitting it into our budget. The tile we chose was Kenzzi Paloma porcelain tile from Wayfair. It got great reviews and people posted many photos of their finished projects with it so I took a chance and I’m sooo glad I did!! One thing to note is that they are pretty thick porcelain so the floor would be the best option for these tiles (although there have been people that have used these for the wall too with good results) There was also not a single broken tile (which I was incredibly shocked by!) and shipping was FREE! Can’t beat that!! Another thing to know about this tile: it has a whimsical/faded “painted” look and the pattern doesn’t always line up exactly. It is SUPPOSED to be this way and I think it adds to the character of the tile. I don’t have a problem with it, but you OCD people out there might. So if you’re like that, you might want to go a different route. We also went with the grout color Charcoal (a medium gray) and I love love love it!! I didn’t want to use black because I thought it might be too harsh and I definitely didn’t want to use white on the floor (been there done that – although white grout does look fantastic – for a minute or two anyway) and I can’t wait to see it with white baseboards and our gray vanity! Coming soon: mudding drywall and SHIPLAP!! Look for that post coming soon!! Can’t wait to get to that finished line! !